NORTH EASTON, Mass. 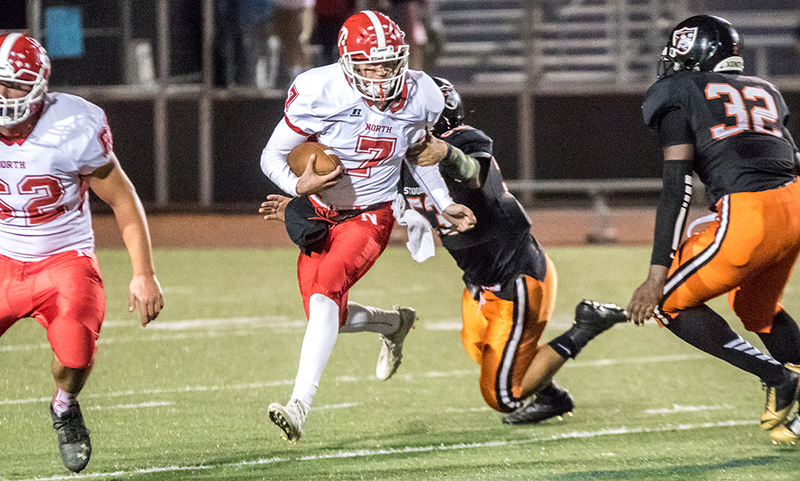 – It’s been a week to remember for North Attleboro senior quarterback Chad Peterson. Just days after giving a verbal commitment to play college football at Amherst College, Peterson scored three touchdowns to lead the Rocketeers to a 35-21 win over Stoughton at W.B. Mason Stadium on the campus of Stonehill College. The win clinches at least a share of the 2017 Hockomock League Davenport title, the third straight league title for the program and Peterson, a three-year starter. The Rocketeers can clinch the title outright with a win against Canton next week. If Canton wins, North can still win the title outright if Stoughton beats Milford. With a chance to three-peat on the line, Peterson and the North Attleboro offense put together one of its best performances of the season, scoring 35 points on a defense that had previously allowed just 41 points total through the first five games. 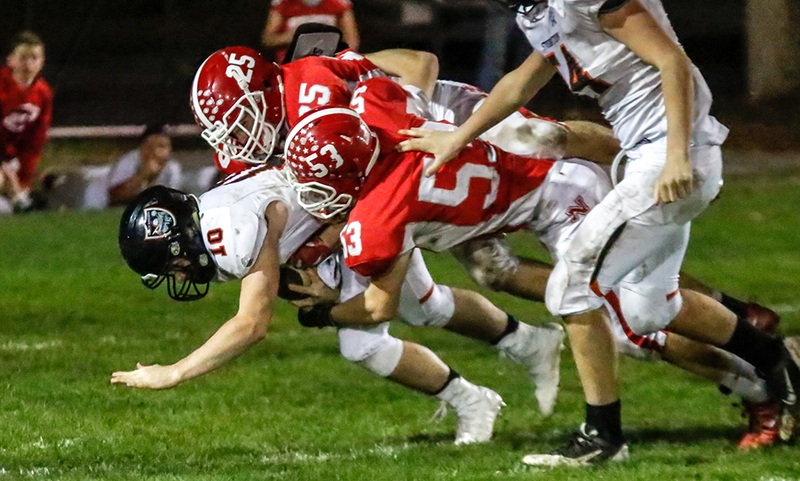 Big Red’s offense scored on two of its first three drives but a late touchdown from Stoughton in the second quarter kept the teams level at halftime. But in the second half, after its first drive ended in a punt, Peterson led the offense on three consecutive scoring drives to put the Rocketeers ahead for good. Despite both defensive units being the top two stingiest in the league, both offenses came out strong. A big return from Stoughton sophomore Ajahn Rue set the Black Knights up with good field position. Eight plays later, senior Alex Sjoquist took the toss to the left side and in for a two-yard score and a 7-0 lead. North’s offense had an immediate response, driving 66 yards on eight plays to tie the score. The Rocketeers didn’t face a third down all drive and junior Nick Raneri (16 carries, 107 yards) punched it in from six yards out to knot it 7-7 with 2:45 left in the first quarter. The defensive units settled in as Stoughton went three and out and punted, but the Black Knights’ defense forced the same from North. North’s defense stuffed Sjoquist on third and shot scenario to get the ball back and its offense took the field, driving 63 yards for a score. Stoughton’s defense nearly shut the drive down early but on third and 10, Peterson (7/12, 88 yards) hit Mario Bresko with a beautiful 47-yard long ball to move the chains. Four plays later, Peterson kept it himself and powered up the middle for a four-yard touchdown and a 14-7 lead. Stoughton nearly had an immediate response when junior Evan Gibb (4/5, 83 yards) hit Ruben Gonzalez for 42 yards, and two plays later again for 16 yards. The Black Knights got inside the 10-yard line but on fourth down, the Rocketeers sent a blitz and junior Ryan Clemente came up with the big hit and get the ball back. North’s offense stalled, giving Stoughton the ball back with just 25 seconds left in the first half. After a holding call pushed the Black Knights back, they elected to run. Senior Justin Ly took off to the right side, cut back through a gap in the defense and sprinted his way for a 65-yard touchdown just before half, tying the game 14-14. Big Red moved into Stoughton territory to start the second half but punted, making Stoughton start at their own 20-yard line. Not only did Clemente’s sack at the end of the first half stop Stoughton’s scoring threat, it also knocked Gibb from the game. Stoughton senior Johnny Medina (8/18, 95 yards, touchdown) took over under center and hit Rue for 11-yards and a first down. But two plays later, Medina was hit as he threw, causing the ball to flutter in the air and Bresko came down with the interception. North was quick to turn the interception into points. Peterson converted a third down with a pass to Bresko over the middle and five plays later, Peterson kept it himself for a one-yard score and a 21-14 lead with 0:29 left in the third quarter. Big Red’s defense brought the pressure again, forcing a quick three and out. Starting with a 27-yard scamper from Brendan McHugh (nine carries, 70 yards), North went 69 yards on eight plays to extend its lead to two scores. Nathan Pearce capped the drive with an eight-yard touchdown on a jet sweep. “They just pushed us around up front in the second half,” said Stoughton head coach Greg Burke. “We had to stop them and we didn’t. They didn’t do anything they hadn’t done before. Their big guy, the right tackle [Clemente] they went behind him each time. Stoughton moved the chains once on its next drive, but three straight incompletions resulted in a turnover on downs, and great field position for North. The Rocketeers took just five plays to drive the 33 yards, with Peterson punching it in from two yards out for a 35-14 lead. Peterson finished with 49 yards on 11 carries, the second most carries by a Rocketeer. The Black Knights added a score with under a minute to play when Medina hit a wide open Ly up the middle for a 51-yard touchdown. North Attleboro football (5-1 overall, 4-0 Davenport) has a chance to clinch the Davenport title outright when it entertains Canton at Community Field on Friday night. North Attleboro will likely clinch a home playoff game with a win over the Bulldogs. Stoughton (4-2, 2-2) will try to bounce back when it hits the road to take on the Scarlet Hawks. FOXBORO, Mass. 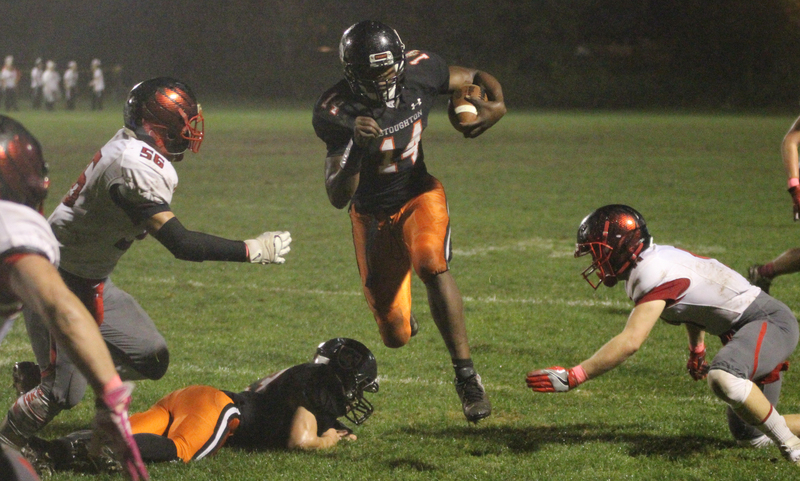 – In a game dominated by defenses and special teams, it was Foxboro senior quarterback Devin Hassett that pulled off arguably the play of the game on a soaked, muddy, and windswept Jack Martinelli Field in Friday’s Davenport division opener. Facing third and 17 from his own 34 and with the Warriors clinging to a one-point lead over rival Stoughton, Hassett (11 carries, 90 yards) rolled out to the far sideline and followed a caravan of blockers, including classmate Mike Henri, before bursting through the opening for a 43-yard gain deep into Stoughton territory. 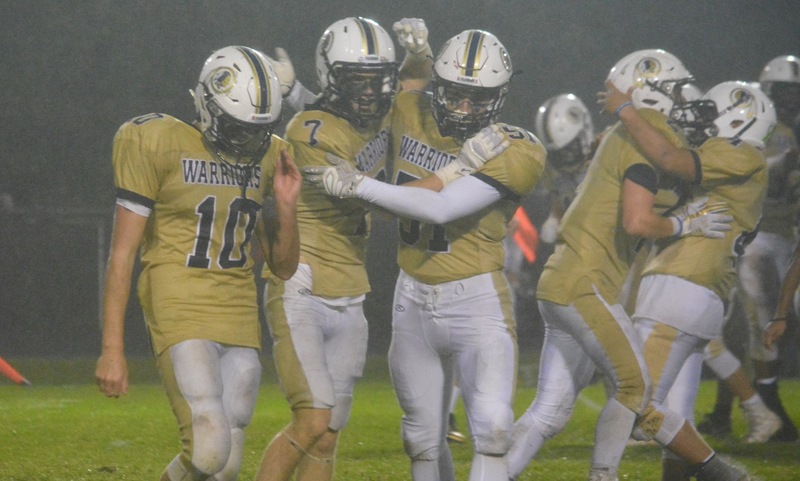 Although the Warriors did not score on the drive, the Black Knights were forced to start their final possession backed up inside their own five-yard-line with three minutes remaining. Stoughton drove about 70 yards but Alex Sjoquist was stopped at the Warriors 30 as the clock ran out on Foxboro’s 13-12 victory. “If we had lost this one they would have taken the sign down probably,” Foxboro coach Jack Martinelli joked after picking up his first win at the field that was renamed for him in the preseason. Foxboro earned its first win over Stoughton since 2009, taking advantage of mistakes by the Black Knights to get its offense going. Stoughton fumbled three times in the opening half and the Warriors scored twice off of those turnovers. Stoughton spent almost the entire first half in its end of the field. Foxboro’s first possession ended in a three-and-out, but Liam Foley’s punt bounced off the leg of a Stoughton player and was recovered by Phil Dure at the Stoughton 35. The Black Knights defense, led by Sjoquist, John Jolley, Jason Joseph, and Anthony Burke, stuffed the Warriors and forced a turnover on downs but Foxboro had the territorial advantage. In the second quarter, Justin Ly was stripped of the ball near the Stoughton bench and the Warriors recovered the loose ball at the Black Knights’ nine. After a penalty and an incomplete pass, Hassett (3-8, 26 yards) found Dure in the back corner of the end zone from 15 yards out to make it 6-0. The momentum was short-lived, as Ruben Gonzalez snared the ensuring kick-off at his own 11 and raced down the right sideline for a touchdown. Dure blocked the extra point and the score was tied 6-6. 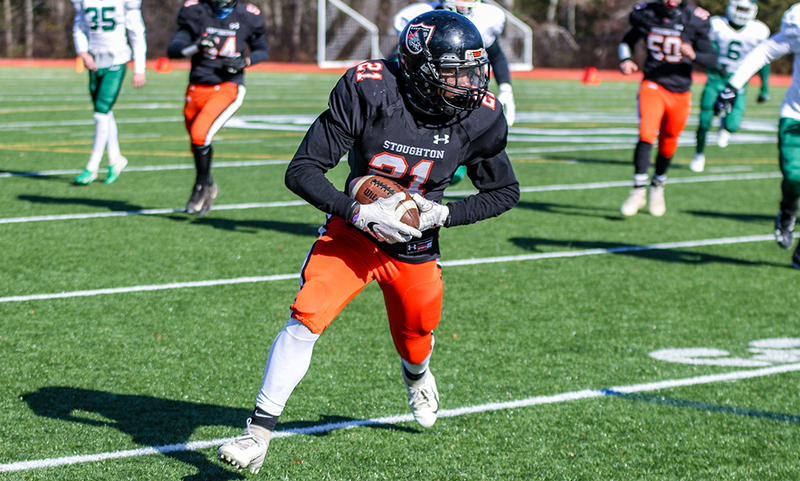 On its next possession, Ly (11 carries, 51 yards) was stripped again and Shawn Teixeira recovered the loose ball for Foxboro at the Stoughton 35. Henri (11 carries, 40 yards) got the call for the Warriors and he burst through the middle for 12 yards on third and four to keep the drive alive and he finished the possession with another bruising 14-yard carry up the middle to give Foxboro the lead. Stoughton had the perfect start to the second half. Facing third and four on the opening possession, Alex Iverson (six carries, 93 yards) took a sweep to the left 26 yards to get near midfield. On the next snap, Iverson took an identical hand-off and this time broke it for a 52-yard score that cut the lead to one. Dure again blocked the extra point, but an offsides penalty gave Stoughton another chance from a yard closer. Burke decided to go for two and the lead, but Iverson was stuffed on the conversion attempt. That point turned out to be the difference. 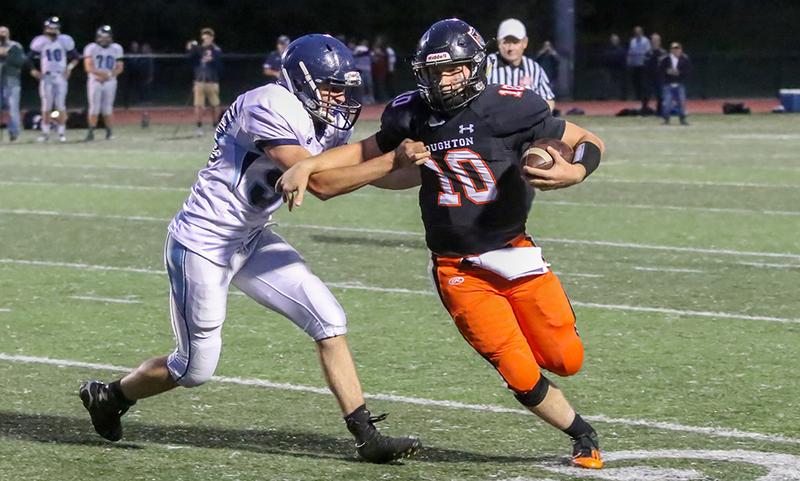 Foxboro’s defense was equally stout in dealing with the three-back look of the Black Knights and Sam Blake, Matt Pond, and AAlec Brodeur stymied several Stoughton drives. After Hassett’s big play pushed Stoughton back to its own goal line, the visitors tried to put together one last drive. Iverson gained eight yards on third down and junior quarterback Evan Gibb (9-13, 54 yards) hit Iverson for 15 yards on fourth and 10 to get to the Foxboro 40. On fourth and 15, Gibb hit Colin Sanda for 15 yards on the Foxboro sideline to keep the drive going, but he could not get out of bounds and the clock ran down. Foxboro (2-1, 1-0) will try to continue its strong start to the league campaign when it travels to Canton. Stoughton (2-1, 0-1) will look to bounce back on Thursday with a trip to Sharon. WEST ROXBURY, Mass. – Even though it’s been a nearly a decade, Stoughton senior lineman John Jolley vividly remembers the last time he found himself in the end zone scoring a touchdown. He was just nine years old, playing Pop Warner. Jolley isn’t likely to forget Stoughton’s 28-14 win on the road at Catholic Memorial anytime soon either. On the last play of the first half, the 6’2, 220-pound defensive end was in the right place at the right time, coming up with an interception and returning it 72-yards for a pick six. Not only was it a once in a lifetime play for a high school lineman, it was a play that completely changed the momentum, and possibly the outcome, of the game. Stoughton’s defense held the Scarlet Knights to just 21 yards over the first three series of the game, but Catholic Memorial was in the midst of putting together its best drive of the half. CM had rattled off eight plays, covering 61 yards to get into Stoughton territory with just five seconds to play. When the Scarlet Knights trotted out its kicking unit for a long field goal, Stoughton head coach Greg Burke used his first timeout of the half to ice the kicker. With Stoughton up 7-0, first-year CM head coach Brent Williams elected to send his offense back out to try and tie the game on the final play. 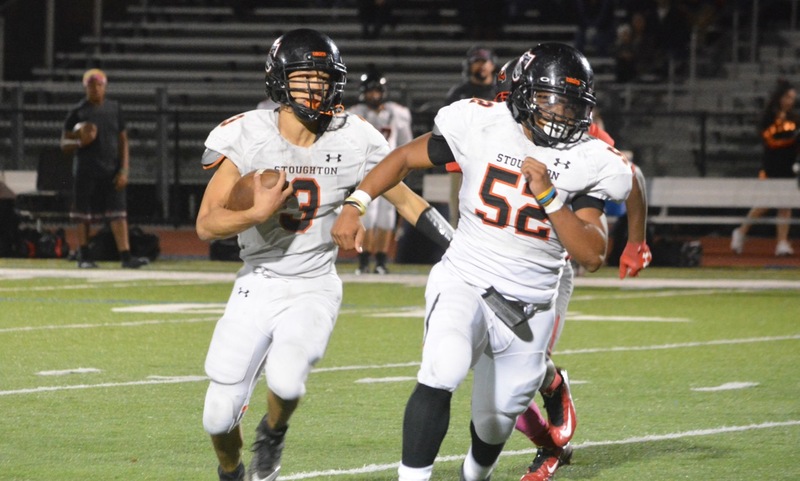 Stoughton ended up getting pressure into the backfield and senior Jason Joseph made a huge play, hitting CM quarterback Nick Goffredo as he threw. The ball fluttered out of his hands and right to Jolley, who caught the ball and sprinted 72 yards for a touchdown. And if you needed any more reassurance of just how big the play was, Stoughton was flagged on the play because its bench ran down the sideline in celebration of the big play. And in a rare instance, Burke was fine was the penalty. “That’s high school!” Burke beamed. That interception was just one play in what was a very solid outing for the Black Knights’ defense. CM scored on its last two drives of the game, but its first five series ended in the following: fumble/turnover on downs, punt, punt, pick six and turnover on downs. “It was pretty steamy out there, first half I thought we did real well on their run game,” Burke said. “They’re a big tough team, they probably didn’t think much of us. Their quarterback was our top priority, especially on scrambling. The end was a little hairy but we’ve got some tough kids. I was really happy, I thought we did pretty well when they came at us. Stoughton’s offense also had a strong day, with four of its six drives resulting in double-digit plays run. Another was cut short by an interception, and its final drive of eight plays ended with the final seconds ticking off the block. The Black Knights were set to receive the opening kickoff but CM’s Will Fay blasted his kick off a Stoughton player and recovered the kick to give the Scarlet Knights the first possession. But on a fourth down in Stoughton territory, Alex Sjoquist came up with a strip sack with the ball bouncing out of bounds to give the Black Knights the ball. Stoughton used a 12-play, 64-yard drive to take the lead. Highlighted by first-down runs of 10-yards and 12-yards by Justin Ly (16 carries, 77 yards), the Black Knights went up 7-0 on an eight-yard scamper by Alex Iverson on a counter play with just 14 seconds left in the first quarter. The game stayed scoreless until Jolley’s pick six right before halftime. The bench penalty forced Stoughton back on the conversion and the two-point attempt was knocked away in the end zone. Stoughton’s defense started the second half as it did the first half, forcing a turnover on downs on CM’s first offensive possession. And its offense also had a repeat of the first half, taking its first possession to the end zone. Ly’s game-long 18-yard run got the drive started early and eventually, Stoughton found itself on the CM 11-yard line. It looked as though Stoughton had a touchdown on fourth down, but an offensive offside call negated the score and pushed Stoughton back five yards. Stoughton came up short of the end zone on the next play, but did get the ball to the 1-yard line on a pass from Evan Gibb (12/16, 137 yards, six carries, 30 yards) to Ruben Gonzalez (six catches, 79 yards) for a first down. Gibb then punched it in on a sneak and then found Sjoquist for the two-point conversion and a 21-0 lead with 5:18 left in the third quarter. CM finally got on the board with under two minutes to play in the third, when Goffredo hit Khari Johnson in the flat. A bad snap on the extra point attempt resulted in a try for a two-point that failed. The Black Knights did a nice job responding, putting together a 10-play, 58-yard drive that took up nearly six minutes (5:57) of the clock. Gibb’s completion of 23 yards to Iverson on a first down surprised the Scarlet Knights and was the longest play of the drive. Sjoquist punched it on an 8-yard toss with 6:41 to play. The Scarlet Knights scored on its final drive of the game. Goffredo floated one to the left side of the end zone and Franklin native Jarrett Martin absolutely climbed a ladder to win a jump ball for a 24-yard touchdown. CM converted the two-point conversion. Stoughton then ran eight plays to kill the final 3:55 and all of CM’s timeouts. “Being 2-0 right now with practically 99% of these kids being new, I’m as thrilled as I’ve been while coaching,” Burke said. Stoughton (2-0) opens Davenport division play on Friday night when it takes a trip to Jack Martinelli Field in Foxboro to take on the Warriors (1-1). RANDOLPH, Mass. – There might be a lot of new faces on the field dawning Stoughton’s black and orange – and at times it certainly showed. 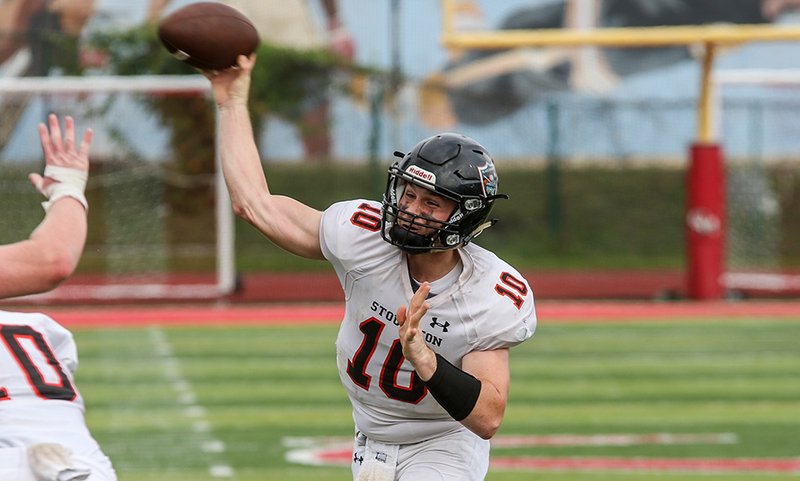 But when it mattered most, those new faces made vintage Stoughton plays to help the Black Knights open the season with a 28-14 win over Franklin. Playing at Randolph High School because of the construction of the new Stoughton High building, as well as a delay in construction in Franklin’s track, the Black Knights looked completely different from last year’s squad. But a goal line stand in the third quarter that resulted in a blocked field goal, and a clock blending scoring drive in the fourth quarter to ice the game looked like true Stoughton football. A much improved Franklin squad came out on its first series and made a splash, going 59 yards on 12 plays to take the lead. Facing a fourth and three in the red zone, the Panthers went for and it and were rewarded. Senior quarterback Jake Noviello (15/31, 169 yards,) rifled a pass to junior Sean Leonard on a quick slant for an 8-yard touchdown. Matt Zucco’s extra point made it 7-0 just under five minutes into the game. Stoughton’s new look offense didn’t have any trouble coming up with a response on its first drive of the season. Ruben Gonzalez (133 all purpose yards) ripped off a 45-yard run on the Black Knights’ first play from scrimmage. On third and goal, junior Evan Gibb (9/15, 154 yards, 4 total touchdowns) fired a bullet over the middle to sophomore Ajahn Rue for a 15-yard touchdown. Josh Cocchi’s extra point tied the game with 1:11 left in the first quarter. The Black Knights defense came up with a red zone on Franklin’s ensuing drive, forcing an incomplete to end the Panthers’ nine-play drive. After Stoughton punted, its defense once again came up with a red zone stop. 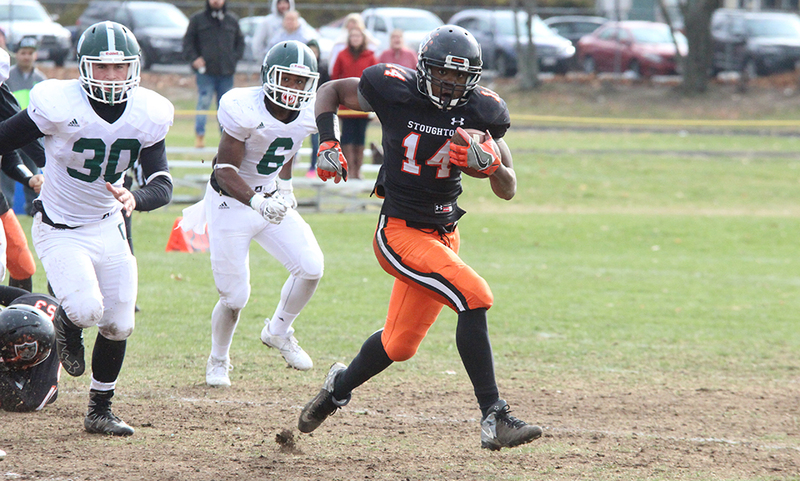 Once Franklin reached the Stoughton 18-yard line, the Black Knights forced another stop. With time ticking away in the second quarter, Stoughton senior Alex Sjoquist (nine carries, 75 yards), ripped off a 28 yard carry to get the drive going. Gibb connected with Gonzalez and Colin Sanda on back-to-back third downs to keep the drive alive. And then on first down, Gibb took a shot to the end zone where Gonzalez was able to leap up between a pair of defenders and haul in a 35-yard touchdown to go up 14-7 with 0:37 left in the first half. Stoughton wasn’t done in the first half though, forcing a quick three and out with just three seconds left. The Black Knights took another shot at the end zone, with Rue leaping over a defender and hauling in the pass but landed at the two-yard line. “[Gibb] did a great job,” Burke said. “He had a couple of nice runs himself, which is going to be part of the offense. He’s a tough kid. He made some great throws. I don’t think he got sacked which is good. It’s good to have him back, and [Justin] Ly and [Alex] Sjoquist and Ruben [Gonzalez] and [Jason] Joseph. You can see the guys who have played before, they are just a step ahead. Franklin’s defense forced Stoughton to punt to start the second half and the offense quickly made its way back into the red zone. A sack from Malachi Hightower-Green preceded a pair of incompletions. Franklin went for it on fourth down and it resulted in a pass interference, giving the Panthers the ball at the two-yard line and a new set of downs. But Stoughton’s defense looked like its vintage self. Franklin was dropped for a one-yard loss on first down, a two-yard loss on second down and an incompletion on third down. The Panthers’ 22-yard field goal attempt was blocked by Stoughton’s Jason Joseph, keeping the Black Knights up 14-7. “It was an incredible series for us. And then we get the block,” Burke said. “That’s hard to do. We toughened up there. We still have some problems, and we have to get more guys playing. But every week we’ll get better, this will be our worst game of the year I guarantee that. It was a good way to start, that’s a division 1 team which is good for us. Stoughton used that momentum to add onto its lead. The offense marched 82 yards on just eight plays to extend its lead. Highlighted by a 30-yard gain from Alex Iverson (six carries, 60 yards), the Black Knights moved into Franklin territory. On third and 15, Gibb hit Gonzalez on a bubble screen and the senior turned on the jets, racing for a 35-yard touchdown and a 21-7 lead with just 0:19 left in the third quarter. The Panthers didn’t quit though, responding with a nine-play, 54-yard drive to get within one score. Noviello hit Jack Nally (8 catches, 88 yards) to convert the first third down Franklin faced. Franklin found itself facing another fourth down in the red zone, and this time they went to its bag of tricks to execute. Senior wide receiver Evan Wendell took the toss in the backfield but instead of a run, he lofted a pass to a wide open Nally in the end zone for a 13-yard score. But in vintage Stoughton fashion, the Black Knights went back to the ground game to bleed the block and restore its two score lead. It took 10 plays to cover 67 yards, capped with a 1 yard sneak from Gibb to make it 28-14. The drive took 5:39 off the clock in the fourth quarter. Franklin’s last push reached the red zone again but Stoughton’s Justin Ly came up with a pass breakup to end the drive. “The scoreboard is the scoreboard, you are what your record is but however this game turned out, I know that we’re tremendously better than we were a year ago,” said FHS coach Eian Bain “We brought a lot back but there’s a special buy in with these kids. Not that last year didn’t, but we’ve had this group for two years and they’ve just kept moving forward every day. They are a competitive group. This game could have easily gone a different way, we have a lot to learn. Stoughton football (1-0) hits the road to take on Catholic Memorial next Saturday while Franklin (0-1) will visit Milford for a non-league showdown with the Scarlet Hawks.